Theater has dialogue, novels have the internal lives of characters, and movies have dynamic visuals. There is, of course, overlap. Many films are driven by dialogue, as are many novels, and the visuals in a Robert Wilson operetta are more important than mere words. But film is, as the cliché goes, a visual medium, and I can’t help but feel those scenes and sequences that manage to tell the story without use of dialogue are the purest form of filmmaking. They take what film does better than any other medium and they use it to its fullest extent. Here are my top five examples (excluding films from the silent era). At only three minutes long, this is the shortest scene on my list by at least a minute, but it’s a remarkable bit of filmmaking nonetheless. What makes it remarkable is that it’s a fairly complex character scene, yet screenwriter Josh Olson and director David Cronenberg manage to pull it off without a word of dialogue. After both Tom Stall’s prior life of violence and the lies he told in order to cover up that violence are brought to light, they threaten to destroy his family. He must resort to further violence in order to protect his family, in order to keep them all together, but in so doing he threatens his new life in another way: by revealing himself to be something other than what his wife and children believed him to be. At the end, after several scenes of brutal violence, Tom returns home. His family is eating dinner. His daughter puts a plate down for him. He sits. His son hands him the roast. Tom and his wife Edie look at one another across the table. Everything we need to know—how much they love each other, how they will try to make it work, how difficult it will be after what they’ve experienced—is contained in that look. Sometimes you can say more about character with silence than you can with words. This scene shows that beautifully. 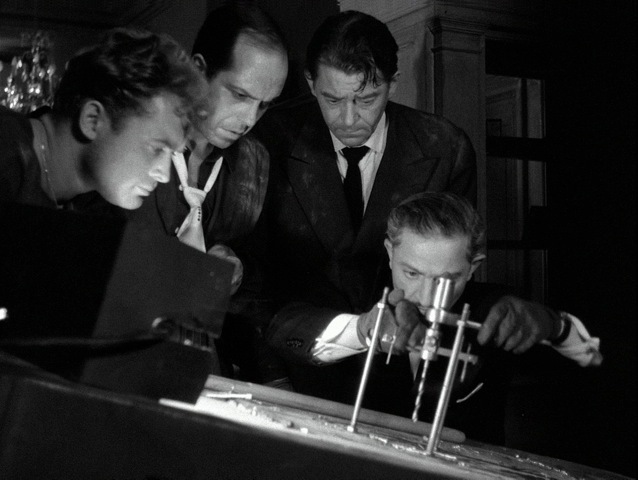 Written and directed by Jules Dassin, an American who found work in France after being blacklisted in Hollywood, Rififi is, for my money, the greatest film noir ever made, not least because of the silent, yet incredibly tense twenty-six minute heist sequence. For nearly half an hour the movie contains neither dialogue nor music. The only sounds are the sounds on location. The tension is created not through dialogue, but through action. Men light cigarettes and share worried looks. They roll up area rugs, pry away floorboards. Someone accidentally bumps into a piano. We cut to a police officer who walks under the room in which the heist is taking place. He pauses to pick up a found pack of cigarettes. All the time you wonder, will these men get away with it? And for twenty-six excruciating minutes you do not know. You watch to find out. You watch in silence, leaning toward the screen, your stomach a knot of anticipation. There is a tension to this sequence that Ocean’s 11, for instance, never comes close to. Written and directed by Michelangelo Antonioni , Blow-Up is a film more concerned with questions than answers. It is a murder mystery in which there may be no murder. The sequence in the park, which begins the mystery, concerns a bored London fashion photographer voyeuristically taking pictures of two young lovers. He stalks them through the park, taking shots through shrubs and from behind trees. The wind blows, but it is otherwise very quiet. During this sequence he may or may not unwittingly photograph a murder-in-progress. When he later develops his film and discovers the grainy image of what may be a body, and the grainier image of what may be a killer, we know he will investigate, and we know this because of that earlier sequence. He is a man who needs a mystery. He is bored of his life and his work. The photography sequence, without a word of dialogue, sets up both the story and the character, and is tense and interesting while doing it. It would be the opening sequence in a conventional film, but because Blow-Up is anything but conventional, it doesn’t occur until the movie is halfway over. Still, it’s a fine example of how much story can be told, and how much character can be revealed, with imagery alone. It is somehow appropriate that a movie about a surveillance expert should have one of the best silent scenes in film. It comes at the end of the movie. Harry Caul, aforementioned surveillance expert, is incredibly paranoid about his own privacy, but learns, finally, that his apartment has been bugged. He is being listened to. What follows is six minutes of progressive insanity, as Caul searches for the listening device in his Spartan apartment. He breaks apart his few belongings. He tears away the walls. He rips up the floorboards. And the destruction of his apartment works as a metaphor for what is happening to his mind, until, when the movie ends, we know exactly what has become of him without need for any explanation at all. We have learned everything we need to know simply by watching his actions. The first fourteen minutes of this film are dialogue free, yet in them the entire story is set up beautifully. We are introduced to Daniel Plainview, a single-minded character who will risk both his own life and the lives of others in order to attain wealth, first while mining for gold, and then while mining for oil. We learn of his intelligence, and the progress he makes as a miner. We learn how brutal life can be on a mine, and in turn, we learn how brutal the world is that Daniel Plainview inhabits. We see him strike it rich, and we see, too, how he ends up inheriting a small child, and through his interactions with that child we see, briefly, the less brutal side of him. All of this without a word being spoken. This is pure filmmaking at its finest. Writers are often told to “show, don’t tell.” When you put across a story in images alone you can’t help but show. There is no way to tell unless you resort to words. None of this is to say that dialogue doesn’t have its place; of course it does, and some of my favorite films are built around dialogue. That said, if you are capable of telling a story in images alone, you can avoid using dialogue to do your expository heavy-lifting, and you can avoid having your characters say things that could be conveyed without words, and, avoiding those things and others, when you do use dialogue, your words are much more likely to sing. One of my favorite silent sequences is the opening of “2001: A Space Odyssey” which goes on for close to a half-hour. We see the lives of early prehistoric man, living in a tribe, fighting with warring tribes, losing and winning battles, discovering the monolith that, through the courage and curiosity of one of them, becomes the teacher that shows them how to use bones to act as weapons to defeat their foes and retake the water hole. Then, in celebration, the main apeman hurls the bone into the air which jump cuts into a modern rocket ship transporting a scientist to the moon to meet about the discovery of the same monolithic shape that has been discovered on the moon. An amazing sequence that is as clear as can be in terms of meaning for the audience without a single word being spoken for almost 35 minutes. Thank you for this, it is very informative and makes me what to hone my writing ever so much more! I’m actually surprised “Up” wasn’t listed here. All the love, dreams, disappointments and heartbreak of a 50-year relationship were covered in a 4-5 minute segment, causing this adult male to bawl and laugh at the same time, just because this “cartoon” provoked such an extreme reaction in me. Accordingly, this segment should have been #1. Leeza nurses a wounded resistance fighter, Sasha, back to health. The Russians want him. This night an argument ensues. Sasha must go back to fight. Leeza storms from the kitchen to her bedroom. Keep? toss? Tragic, poetic atmosphere it wish to create. Closed curtains, lights off, a grey space, warns of lovers on the edge of doom. Tonight, words are not welcome in this room. Fully clothed, she rocks in bed. Knees pulled to chest, stares straight ahead. His gentle gait joins her bed. One bare finger wipes one lonely teardrop from her cheek. She doesn’t speak. The lovers rock together. He leans forward, lips sweep across her flushed red cheeks. Still no words to give him peace. His desperation traps her eyes close range with his. At last, a hint of a grin peeks from her face. Lips touch. Then touch again. His embrace nests her body secure in place. He lay awake ‘til sleep shows serenity upon her face. He sneaks from bed, a soft kiss goodbye upon her head. Over to the dresser, opens a drawer, takes a look, slips a note inside the sketchbook. Tiptoes to the exit. Turns to remember his love once more. Her eyes open. A state of grace. Sends a tragic tear down her face.